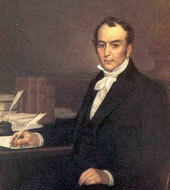 Louis McLane was appointed Secretary of State by President Andrew Jackson on May 29, 1833. McLane entered duty on the same day and left the position on June 30, 1834. He was an able administrator who eventually clashed with President Jackson over foreign policy. McLane was born in Smyrna, Delaware. As a young man he served as a midshipman in the Navy from 1798 to 1801 and then attended Newark College (now the University of Delaware). After reading law, McLane gained admission to the Delaware bar in 1807. Embarking on a career in politics, he won election to the U.S. House of Representatives in 1816. He served five terms until moving to the U.S. Senate in 1827. Two years into his Senate term, President Jackson appointed McLane as Minister to Great Britain. McLane served in London from 1829 to 1831 before returning to Washington to join Jackson’s cabinet as Secretary of the Treasury from 1831 to 1833. While serving as Minister to Great Britain, McLane conducted the 1831 negotiations over an important agreement that allowed U.S. trade with the British West Indies. This breakthrough resolved a dispute dating back to the John Jay Treaty, which was ratified in 1795. As Secretary of State, McLane’s central achievement was a successful reorganization of the Department of State’s staff into distinct bureaus. His main foreign policy success was an arrangement with the Spanish Government that settled U.S. claims for property seized by Spain during the Napoleonic Wars. McLane quickly encountered the tough issues that had frustrated his predecessors Martin Van Buren and Edward Livingston. Namely, the northeast boundary dispute with Great Britain still proved to be intractable. The Mexican claims and boundary issues also remained unsettled. Finally, McLane’s efforts to resolve the longstanding dispute with France over the damages inflicted upon U.S. foreign commerce during the Napoleonic Wars led to the end of his tenure as Secretary of State. A treaty had been signed in 1831, but the French Government refused to issue the payments stipulated therein. McLane supported a policy of reprisal against French exports. When President Jackson decided against reprisals, McLane opted to resign. McLane eventually returned to diplomacy in 1845 when President James K. Polk appointed him U.S. Minister to Great Britain. His hopes to negotiate the Oregon Territory boundary were disappointed when the talks instead commenced in Washington. Commissioned during a recess of the Senate; recommissioned on February 10, 1830, after confirmation. Commissioned to the court of the United Kingdom of Great Britain and Ireland. Commissioned during a recess of the Senate. Commissioned during a recess of the Senate; recommissioned on December 23, 1845, after confirmation. Commissioned to the court of the United Kingdom of Great Britain and Ireland.